Karan Acoustics KA I180 Mk2 review | What Hi-Fi? Few amplifiers have impressed us as much as the Karan Acoustics KA I180 Mk2. Even up against some very talented pre/power combinations, this single-box amp stands out as something unusual. All hi-fi products have some character. You can hear their sonic imprint when they’re part of a system. If you like that sound, or it suits the rest of your set-up, that’s just fine. Yet, if hi-fi is meant to be all about hearing the source material in its purest form, even the best kit still has some way to go. Now, this Karan Acoustics integrated amplifier has some character, but that character is so benign that it barely registers. All that’s left is the quality of the recording and the sonic signature of the rest of the kit in your system. To reach this standard the amplifier must have certain talents. Tonally, it’s got to be spot-on. The Karan Acoustics may not be quite as open sounding as our reference Bryston BP26/4BSST2 pre/power combination, but it sounds more balanced and cohesive throughout the frequency range. No part of the frequency range sticks out or is underplayed, leading to a natural, even-handed presentation that refuses to favour one instrument over another. But, there’s far more here than just a convincing tonal balance. The sound is built around a precise and stable rhythmic framework. The amplifier’s timing is spot-on, so it conveys the interplay between instruments beautifully. The way this amplifier handles the opening of The Rolling Stones’ Sympathy for the Devil a joy to hear. It ties together the various percussive element and Mick Jagger’s distinctive vocals superbly, giving the song a strong sense of momentum right from the start. As the rest of the instrumentation comes on stream it’s the Karan Acoustics’s composure and stability that impresses. It always sounds in control and unruffled, but importantly, never dilutes the music’s excitement. Move onto the likes of Holst’s Jupiter Suite and the good news continues. Here’s where the Karan Acoustics shows its muscular side. A power output of 180 watts per channel is plenty, particularly when it rises to 300W when impedance halves to 4 ohms. There’s plenty of scale to the sound and a pleasing solidity to low frequencies. 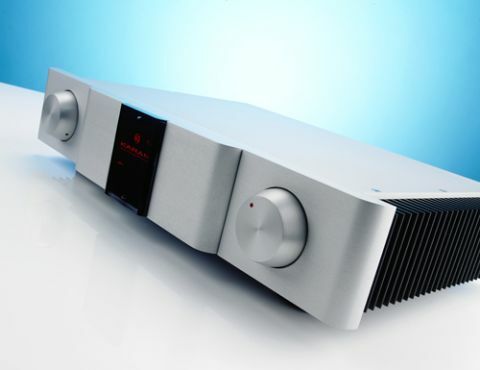 We’re impressed by the unstressed way in which this amplifier delivers large-scale dynamic swings, and the level of insight it has once the music becomes complex. It’s a full-bodied presentation that’s sweet without lacking bite. There’s an awful lot of information uncovered, but the Karan Acoustics never sounds overly analytical because it manages to tie that detail together in a wholly convincing way. Such a performance never comes about by accident. The KA I180 Mk2 is built and designed with obsessive care. The casework is immaculately made and feels immensely solid. Both the input selector and volume control feel lovingly engineered to have the right combination of weight, resistance and precision. Take a look inside and its clear Karan Acoustics has done a terrific job. This is a dual-mono design where the left and right channels are kept separate as far as possible. There’s plenty of evidence of top-quality components being used in the circuitry. A great deal of care has been taken over the power supply design and it’s as generously specified as the power output figures suggest. Features are as limited as they always are with products such as this. There are three single-ended line-level inputs together with one balanced XLR stereo option. There’s also a Record Out for those want to, well… record. That’s it as far as connectivity is concerned. If you have a turntable you’ll need a good quality outboard phono stage to make things work. A rather nice, simple puck-like volume control completes the package. It offers just volume adjustment, limited in the extreme, but for most of the time that was all we needed. The Karan Acoustics KA I180 Mk2 is for those who want an amplifier that simply gets out of the way of the recording. It will give you plenty of insight and communicate the music’s message as effectively as the very best amplifiers around. Even at six grand, there is little available, be it integrated or in separates form, that gets close to this level of ability.